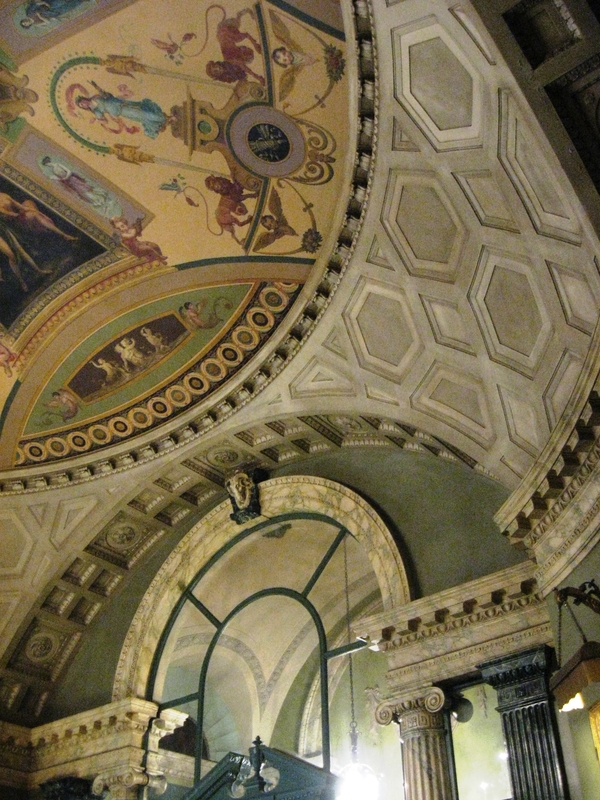 The rotunda inside Steinway & Sons retail space at 109 West 57th Street in Manhattan. Image Credit: CityLand. Owner’s representative expressed support for designation; testified that landmark would be preserved in context of planned larger development. On July 23, 2013, the Landmarks Preservation Commission held a hearing on the potential designation of the reception room and adjoining rooms and hallways of the Steinway & Sons retail space at 109 West 57th Street in Manhattan. The neo-Renaissance interior was completed in 1928 to designs by the firm of Warren & Wetmore. Warren & Wetmore was the architecture firm behind several other City landmarks, including the interior of Grand Central Terminal. The primary interior space is an octagonal double-height rotunda, in which customers were met by sales representatives before entering the showrooms. The room features a crystal chandelier and allegorical paintings, by Swiss-Austrian painter Angelica Kauffman, adorn the domed ceiling. The room is visible from the street through large display windows. A foyer on the 57th Street entrance possesses white marble arches on Ionic columns on its four walls. Though some rooms are separated by glass or glazed infill, the interior reads as one continuous space. The Historic Districts Council’s Nadezhda Williams, speaking in support of designation, said that “seeing an elegant Steinway piano in such sumptuous surroundings is rather like seeing an animal in their natural habitat.” Christabel Gough, of the Society for the Architecture of the City, said the “iconic New York institution” served to “express the grandeur and importance of the concert piano” in the City’s culture. Chair Robert B. Tierney closed the hearing after thanking JDS for their “cooperation and participation.” A date for a vote on designation has not yet been scheduled. LPC: Steinway & Sons Reception Room and Hallway, First Floor Interior, 109 West 57th Street, Manhattan (LP-2551) (July 23, 2013).